The bizarre week leading up to inauguration was a strangely fitting one. There were new allegations of Russian meddling with Trump, salacious new allegations about the billionaire’s private life, and ever more speculation about foreign intrigue. But if the new allegations are true, writes Jill Richardson this week, the implications aren’t just amusing — they’re potentially dangerous. Of course, the real action happens after inauguration. And top of the next administration’s list, along with Republicans in Congress, is the repeal of Affordable Care Act (aka Obamacare). In this week’s package, Josh Hoxie reveals a potential motivation for the full-tilt GOP assault on the law: Repealing it would be a massive tax cut for millionaires. Speaking of, another Obamacare opponent — Rep. Tom Price — is facing confirmation hearings to be Trump’s health secretary. The man tapped to lead the nation’s health policy doesn’t just oppose universal health care, LeeAnn Hall explains: He’s deeply invested in pharmaceutical companies that have hiked up prices for live-saving drugs. Also this week, Mitchell Zimmerman urges the incoming administration to honor the Obama administration’s pledge to protect young undocumented immigrants brought here as kids. Jim Hightower parses a proposed “tax holiday” for multinational firms. 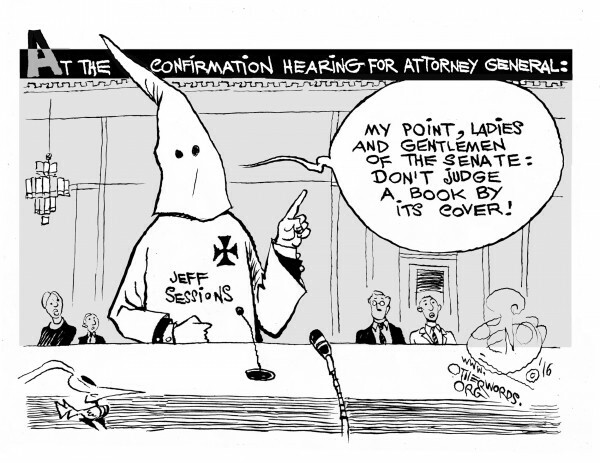 And Khalil Bendib imagines a Klan-clad Jeff Sessions testifying for the attorney general job. If Obama’s health law is reversed, taxes will go down for the rich and up for the poor, while millions lose coverage. Many good kids — with the same American dreams my grandparents had — now fear being exiled to a land alien to them. The next health secretary shouldn’t have a record of benefiting from prescription drug profiteering. Maybe it’s all a salacious lie, but imagine what Russia would do if it could blackmail a sitting president. Trump’s proposed “tax holiday” would reward corporations for dodging taxes and slashing jobs. The post In OtherWords: January 18, 2016 appeared first on OtherWords.